For February, Cheryl of Texas Quilting Gal, Hive 12 of Stash Bee asked for the Dutch Rose block. This block is also currently well known as the Swoon Block from Camille’s fame. 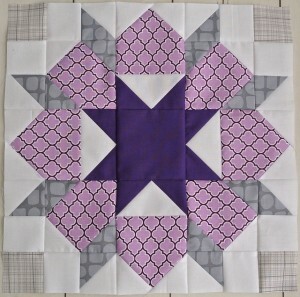 She had us use this tutorial from The Double Nickel Quilt Challenge blog. Also, I know this is not the 100% original layout of the Swoon/Dutch Rose. I did it on accident at first, but the more I look at it, the more I like it. I think maybe even more so than the traditional version of this block. I really want to try one that doesn’t have the white part in the gray and purple lattice square corner. I think that could look really cool. 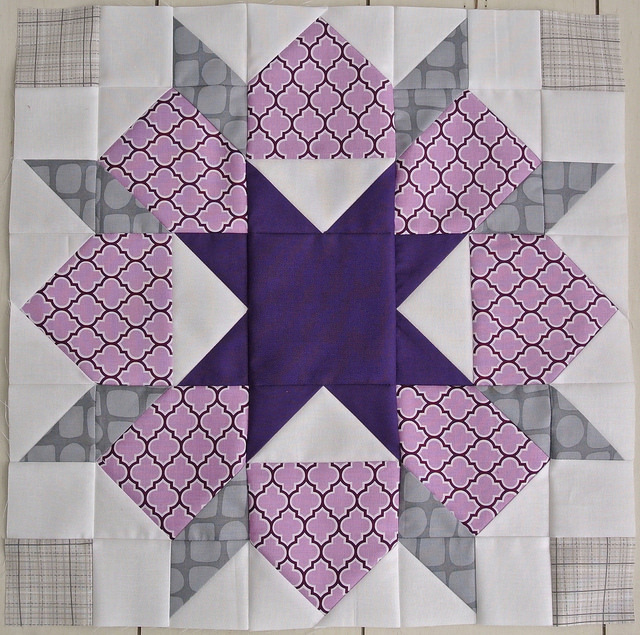 Cheryl asked for a radiant orchid inspired, purple and gray block. I realized that despite liking purple, I only have about 8 purple fabrics and half of those have some other color mixed in. Hopefully with Radiant Orchid as the Pantone Color of the Year, the quilting fabric companies will make some good purple fabric this year. Anyway, on to talk about the block. The tutorial was designed to use charm squares, but if you are cutting yardage leads to quite a bit of waste. Or as the write refers to it, “bonus blocks.” I don’t personally like as many “bonus blocks” as this leads to, so I re-did the math on some portions and maybe I can save someone else some fabric. The first change I made was to use the no-waste method of making the flying geese units. This method makes 4 units, and this block requires 4 units. Perfect, right? To do this method, I used this tutorial, or you can just google “no waste flying geese” and find others. 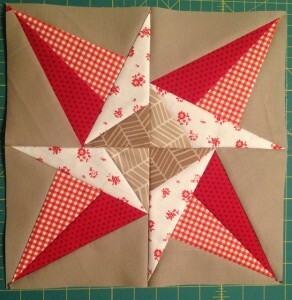 To make a flying geese unit that is 2.5″ x 4.5″ (as required by the tutorial), you need 1 square of background fabric that is 5.75″ square and 4 squares of the star fabric that are 3 3/8″ square. This creates 4 units that need to be trimmed down to 2 1/2 by 4 1/2 inches. As you trim them, you can make them more perfectly shaped so that the block goes together better. No waste half square triangle units…. The second change was to the HST blocks. In this method, you end up with 8 “bonus blocks”. Or, you can use a no-waste method. I used the 2-at-a-time method from this tutorial. I don’t know why I did that, I should have done the 4-at-a-time method. Both ways are demonstrated at that link. To do the 2-at-a-time method, you need 4 squares that are 3 3/8 inches of each color. 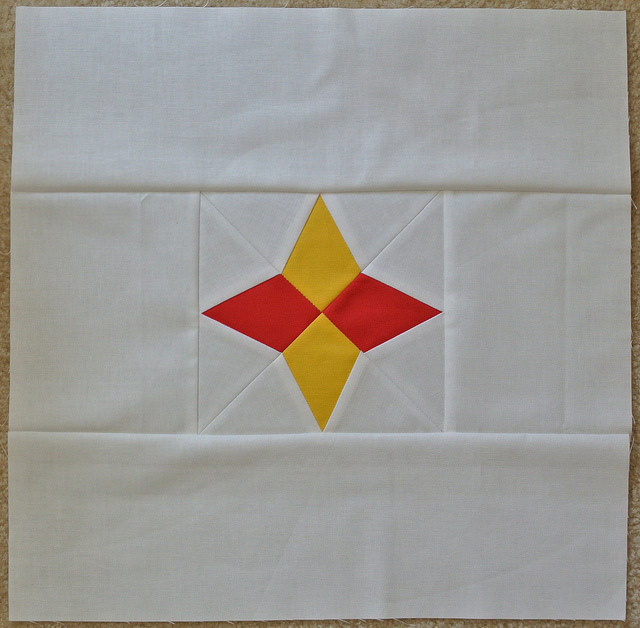 Follow the tutorial, and you will make 8 HSTs without any wasted fabric. Once again, these need to be trimmed down. Using this method, the only waste is below, and it is unavoidable due to how the pentagon shaped sections are formed. The truly no waste method would be to construct those sections using HSTs, but then the pattern gets broken up, so I consider this a small price to pay for the neater appearance of the final block. I’m a little late making the block this month, but I hope this isn’t too late to help someone else out. I hope you like your block Cheryl! Linking up to: Anything Goes Monday, Whoop Whoop Fridays @ Confessions of a Quilt Addict, and Fabric Frenzy Friday @ Ft. Worth Fabric. Guest Post at The Business of Machine Quilting! In addition to my personal quilts and baby clothes making endeavors, I am also a professional long arm quilter. I keep my business website at Quilts Actually, and that is where I show off my competed quilting, but this news was too exciting to limit to just that website. If you love quilting, I’m sure you have heard of Angela Walters. She has a relatively new blog about “The Business of Machine Quilting” to help other machine quilters. It is a great resource, and I am honored and excited to have a guest post there today on finding inspiration as a quilter. Clicking on the button will take you to the post! January flew by! 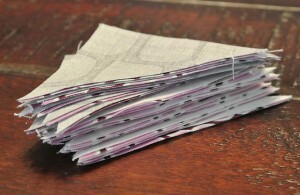 I can’t believe it’s already time to do a summary for Fresh Sewing Day and the Small Blog Meet. For those coming from the Small Blog Meet, I am a quilter that loves to piece and quilt, and sew clothes for my 1 year old daughter. Welcome, and please check out the other projects on my blog. I joined two bees so far this year. I’m really enjoying it so far. It’s a lot of fun to do colors and blocks that I wouldn’t have thought of myself. For the Stash Bee, I made this red and yellow block for Heather from Quilts in the Queue. I made my test block for the 4×5 Modern Bee. I also participated in Kids Clothes Week. Part 1 of my week can be found here. The pants were really the highlight of the week. 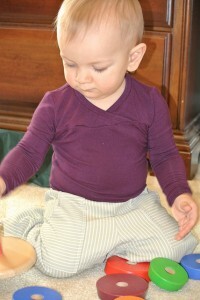 I finished up the week by turning the Oliver and S Hopscotch Knit top into a onesie. The completed outfit is shown below. 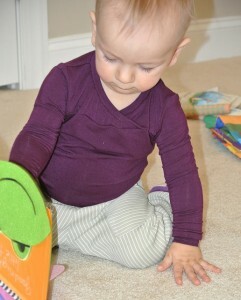 She kept pulling on the neck, I think because it is much stretchier than the onesies she normally wears. It’s such a soft knit, I kind of wish it was for me. 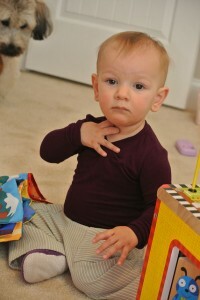 However, I only had 1/2 a yard, so I managed to get a 12-18 month onesie and thought I was doing good. 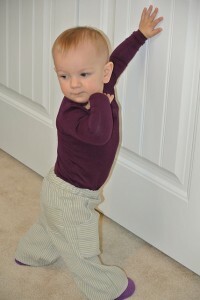 The linen pants are a little big despite being 12-18 months, but I’m ok with that because I love them and hopefully they will still fit this fall. Thanks for checking out my blog, and I hope you stick around and see what else I have here! Linking to Lily’s Quilts Fresh Sewing Day and Small Blog Meet, Anything Goes Monday, and Feather’s Flights.